In business since 1990, Kieran Kelly Haulage Ltd. are busier than ever. At the heart of the Ennis, County Clare based family-run operation is a magnificent fleet of vehicles manned by skilled and experienced personnel. Irish Trucker caught up with Shane Kelly to get an update. Specialising in stone, subsoil, sand, gravel, tar and muck shifting, Kieran Kelly Haulage Ltd. provides an exceptionally high level of service across counties Clare and Limerick; sometimes further afield. The business has gone from strength to strength in recent years, continuing to serve a wide range of customers, including construction companies, county councils and private clients. Considering the nature of the work carried out, with vehicles moving in and out of quarries and construction / roadworks sites on a daily basis, the pristine condition of the fleet is a credit to the Kelly family, whose involvement in haulage goes back three generations and some 70 years, to 1948, when the founder’s father started drawing sand, gravel and topsoil. Today, Kieran – who started out from modest beginnings 28 years ago, with one tipper truck - is joined in the running of the exceptional family business by sons Shane, PJ and Jack as well as Shane’s partner, Clare, who works in the office. A family business with a family ethos and a personal touch! Including show trucks, which turn heads and regularly collect prizes at truck shows nationwide, the fleet at present comprises 24 trucks. Everything at Kieran Kelly Haulage is geared towards providing a top quality service. Fully-permitted and with an exemplary safety record, all drivers hold full licenses, safe passes and have successfully completed the CPC course. The stunning mixed fleet is maintained in superb condition at all times (gallons of Autosmart purchased from Crowley Chemicals in Cork!) and this has resulted not just in the highest levels of safety and efficiency – not to mention high praise from the public and fellow hauliers - but also in several awards, including Best Working Tipper at the inaugural Full of the Pipe Show eight years ago. It was a busy summer for the Kellys with regards to truck shows. 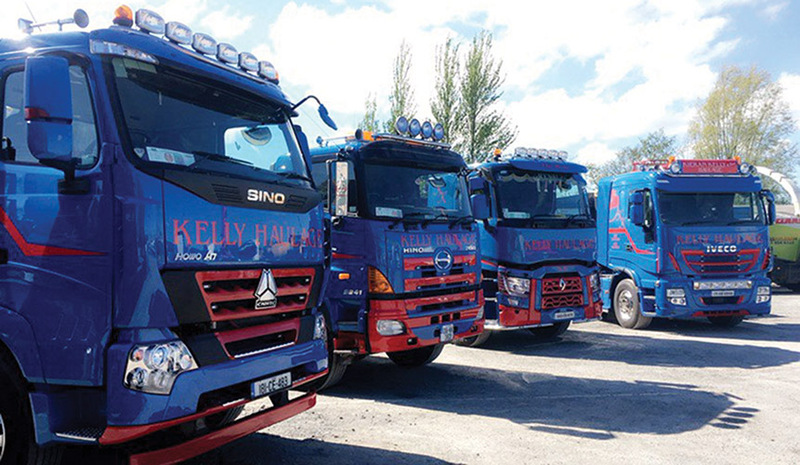 In May, Kieran Kelly Haulage was also represented at the Clare Truck & Plant Show and Waterford Truck & Motor Show. At the time of writing, minds were turning to the Dualla Show on Sunday, August 26th. The fleet mostly comprises Hinos and Ivecos. “Hino was Kieran’s first truck and he still drives an ’01 Hino every day,” says Kieran. “That’s his pride and joy and, to be fair, it doesn’t take that much to keep it in top condition as they are a very reliable truck and economical. In the past two years, Kieran Kelly Haulage have also taken possession of two new tipper trailers from Dennison Trailers. They’re also purchasing a new Kobelco 18-tonne digger from McSharry Bros in Roscommon. Direct employment is currently generated for a team of up to 20. “We’re flat out,” says Shane. “We’re still doing a lot of work for Ryan’s Quarry beside us here in Ennis as well as Lagan Tarmac and a good bit of work with Clare County Council on the roads. 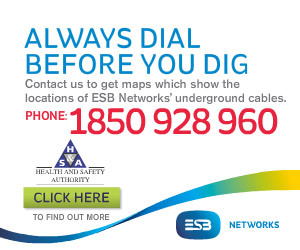 We’re muck shifting on sites in Limerick, where we have work with Conack Construction at the moment. “We’re doing a bit for Goulding Fertilisers and Grasslands in Limerick, using flatbed trailers and an artic and tipper carrying loose fertiliser from the boats into the sheds. We still have two concrete mixers with Roadstone too. “There’s a lot of investment going into it but the work is out there and you have a better chance of getting it when you have a big enough fleet. If they want three or four lorries and you turn up with four or five and make a good start and get the job done quickly, then there’s a good chance you’ll get brought in for the next job. The business is in a strong position and Shane is confident that the future is bright going forward: “We’ll keep plugging away and we might get bigger or we might get smaller. It depends on demand,” he concludes.